Last edited by rhythminmind on Thu Oct 18, 2012 1:57 am, edited 6 times in total. Treat it just like a verb. You will need to increase the L FREQD duration to handle the long tails (located on the Nebula MAST page) 8000 = 8sec tail, 6000 = 6sec tail, ect, ect & exit/restart nebula. Nebula can't adjust delay times once captured, so it is what it is. But I will say if the set timing works for the song the saturation is wonderful. Also in these cases - until nebula is able to adjust repeats and delay parameters - automation on the send is your absolute friend. Thanx Rhythm,Thanx Transending. Sounds real good,ill check this out as soon as i have time. Whoa, what an amazing surprise! 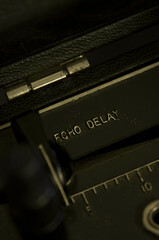 I've never even seen a delay sampled for Nebula, let alone an Echoplex. I thought it must not have been possible or something. Thanks! Thanks a lot for the program. Would a short slap be possible? It could be useable on quite a large scale I'd think.